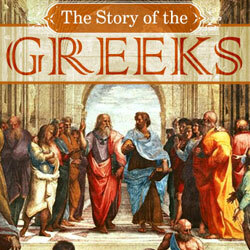 The Story of the Greeks is a soft-bound 8-1/2×11 inch book of 228 pages. There are 123 chapters, with each chapter consisting of about one to one and one half pages of text. The cover art is taken from The School of Athens by Raphael, housed at the Stanza della Segnatura, the Vatican, Italy. The Story of the Greeks opens with the rise of the Grecian people from Japheth, the son of Noah, and the dispersal of the peoples at the Tower of Babel rebellion in 2242 BC. It closes upon the annexation of Greece as the Roman province of Achaia in 146 BC. This book, like all the others in Guerber’s history series, is meant for a child’s first introduction to the history of ancient Greece. It was written with second graders in mind, which is the age we recommend it is read (however, it still remains a child’s first introduction to history, no matter what age history study is begun). Depending on the individual child’s reading ability, it may or may not be too advanced for a second grader to read independently, but very appropriate for a history read-aloud for any children in the grammar stage. Although we encourage everyone to use the Guerber histories, including The Story of the Greeks, with their children in the grammar stage, or first through sixth grades, we have heard from many parents whose teens read these histories with great enthusiasm. Why is Christine Miller listed as the author, and not H. A. Guerber? 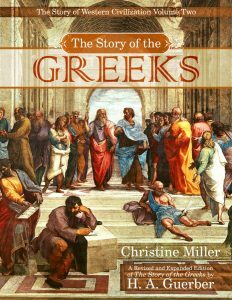 Do you have a question about The Story of the Greeks?